Video games can take themselves so seriously, can’t they? Murder, violence, death, and enough blood to fill the English Channel, we play hours of sombre titles and often forget that there was once a game about a superhero called Boogerman. Equally as bonkers and ridiculous in its tone was ToeJam & Earl, releasing all the way back in 1991. It was so ‘out there’ that nothing around at the time could match it’s mirth, and over the next 28 years we saw a further two sequels – yet nothing matched the charm of the original. 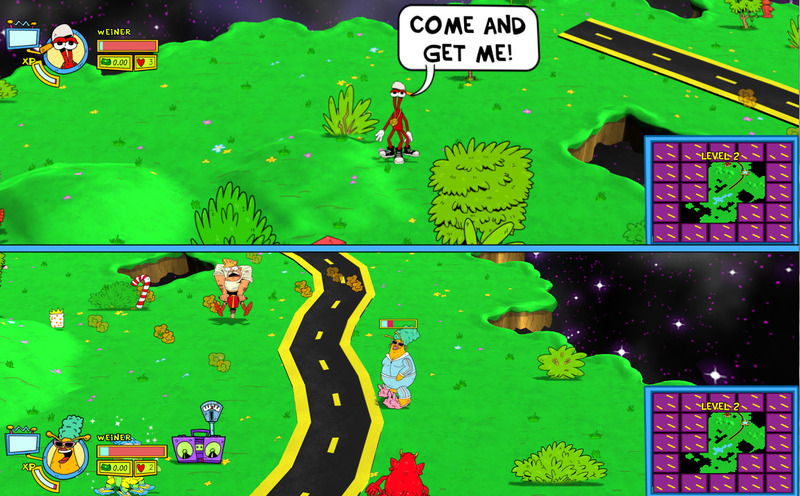 HumaNature Studios, created by Greg Johnson, the mastermind (or mad scientist) behind the very first game, has had a rocky road to get the fourth entry in the series to finally release, but after a successful Kickstarter campaign and a few years of hard work, the world now gets to play more ToeJam & Earl. Is that a good thing? Kind of. Whilst it feels very much like the original, there’re things about it that feel as old as the Sega classic. Movement is rough and lacking fluidity, as well as some problems when trying to interact with some of the scenery. But I’m getting ahead of myself. Let’s try and delve into what makes ToeJam & Earl: Back in the Groove so unique. 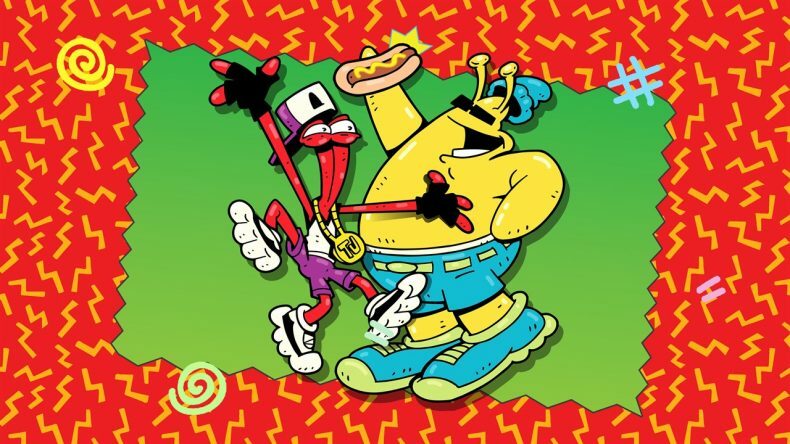 ToeJam & Earl are two funky dudes, jamming to old school 90s hip hop and acting cooler than yo mamma’s Walls vanilla ice cream. They’ve crash-landed on Earth, and their Rapmaster Rocketship has broken into pieces, now scattered across various levels which you must collect. The tutorial mission gets you learning the basics, then it’s straight into the normal game for much more variety. 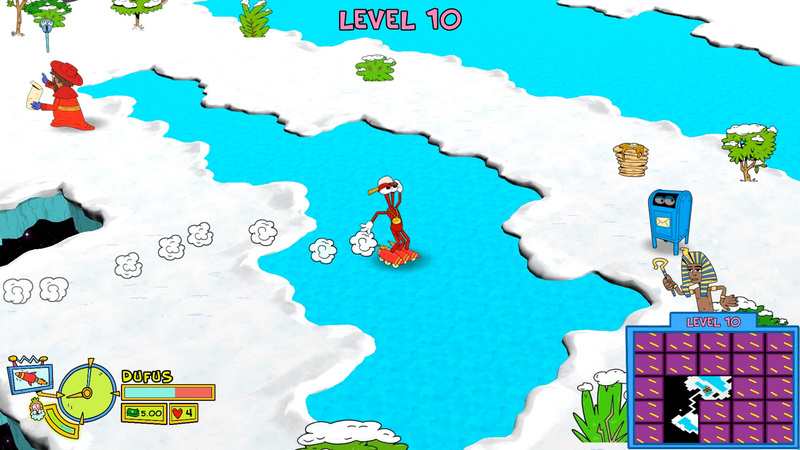 The isometric viewpoint replicates that of the original, and the roguelike gameplay means each level is different, featuring fields, lakes, sand, and snow. What makes it utterly nuts is the various characters you interact with, and the enemies you must try and avoid each level. Not just that, but there’re lots of presents you find and unwrap that give you plenty of different skills to help you out. Some levels don’t have any ship parts on them, but it’s up to you to explore each level and see what it does have. There’s tons of money to find which you can spend on things like sushi, a dice-rolling game with three naff superheroes, or even get an opera singer to push out a bombastic melody from her diaphragm. There’s a Wise Man (dressed as a carrot, obvs) knocking about who’ll tell you what presents you have for a couple of dollars, and he’ll also give you a promotion – essentially levelling up to you and I – that grants you a few extra stat points. Beyond that, there’s the SuperFunk Zone that takes you away from the game to take part in a psychedelic side-scrolling minigame that grants you some bonus XP, a rhythm minigame that’ll give you some money if you’re good enough, and a hell of a lot more. The majority of stuff is silly but fun, and that’s what you want from a ToeJam & Earl game; nothing about this game makes sense, and I dig it. Each level is inhabited by lots of different ‘Earthlings’ that try to annoy you and at times want you dead. I’d love to have been at the brainstorming section for these because the range of ideas on show is staggering. There’s a guy with a jackhammer that makes you drop presents, a gaggle of ducks with a canon that fires eggs at you, an ignorant kid with a handheld gaming console who runs into you, a caveman, a fat man on a segue, a yeti, and loads more. Each enemy has something that’ll cause you grief, but there’re ways to stop them. The presents you find give you certain powers to help you cope with their attacks. You can use tomato rain that falls on the map and gets rid of them, or the roller skates can ram into them and knock them off the map to name a few. On some maps there’re patches of sunflowers, and hiding behind these will make them lose your scent. Perhaps the most annoying thing about the enemies is their ability to knock you off a level, causing you to fall to the previous one. There’s an invisible monster that charges at you, and someone who calls the end of days, forcing you to return to the last level, both becoming a pain in the arse. To get back up, or to advance to the next level you must find a lift, but even then there’s an elevator that turns into a monster and kills you. It does get difficult at times, but that’s part of what makes roguelike games playable. There’re plenty of tasty treats like cake, watermelon, and bacon and eggs that’ll replenish health, however, eat some rotten mushrooms or fish bones and your health will deteriorate. Oh, and Gandhi’s about, so if you find him stick close as he’ll protect you from the creeps that inherit the earth. As I mentioned earlier, movement isn’t smooth at all, and when shaking a tree or a bush to find items, it’s not as easy as it could be. It’s not a deal breaker, but in today’s games you expect better. Some of the Earthlings are painfully irritating, such as the hula girl that makes you freeze to the spot to join her in a little dance every few seconds, and the man-sized cupid who hits you with an arrow and stops you moving up and down for far longer than is necessary. ToeJam & Earl: Back in the Groove is a nice throwback to a much-loved classic, and whilst some of the roguelike gameplay does work rather well, it still feels like the entire experience is stuck in the past, hampered by some basic mechanical flaws. Still, I enjoyed the sheer wackiness of it, and the creativity gave me plenty of laughs. It’s also a lot of fun playing with a friend, whether online or locally, because experiencing the weirder side of the game is much better when sharing with others. 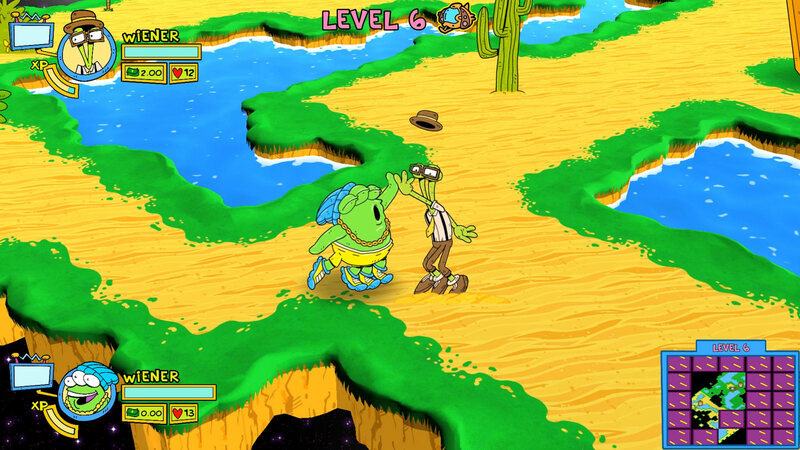 ToeJam & Earl: Back in the Groove is a weird and wonderful world filled with colourful characters, but some of the movement feels archaic.